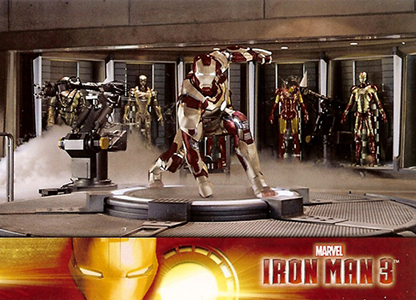 2013 Upper Deck Iron Man 3 brings the comic-based blockbuster to the hobby. Loaded with memorabilia cards and other inserts, the set has content for both fans of the film and the comic. The 2013 Upper Deck Iron Man 3 base set has just 60 cards, making it relatively easy to put together. A Extremis parallel puts a foil spin on the set. Parallels fall one per pack. 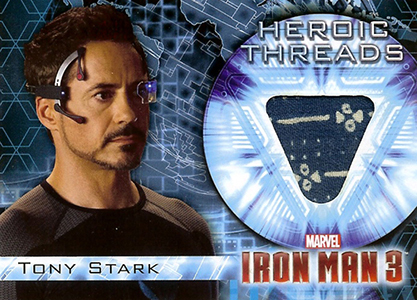 2013 Upper Deck Iron Man 3 hobby boxes deliver three total hits. 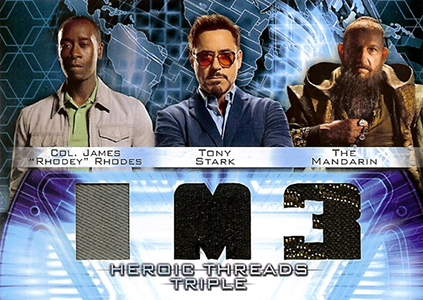 Inserted 1:12 packs, Heroic Threads Memorabilia cards have costume swatches worn in the film. Boxes also have either an autograph or a sketch card. Actor Autographs (1:144 packs) have signatures from the movie's stars. The set also has Comic Autographs (1:144 packs) that are signed on-card by Iron Man writers and artists. Sketch Cards (1:36 packs) all have original art done directly on the card. Hall of Armor (1:36 packs) is an acetate set that looks at Iron Man's many suits of armor. Click here for a detailed look at the set including images of all 22 cards. Printing Plates are also randomly inserted in packs. 2013 Upper Deck Iron Man 3 hobby boxes have 24 packs of five cards. 60 cards. Shop for base sets on eBay. 1:36 packs. Click here for a detailed look at the set. I hope Ben Kingsley and Gwyneth Paltrow are on the auto list! 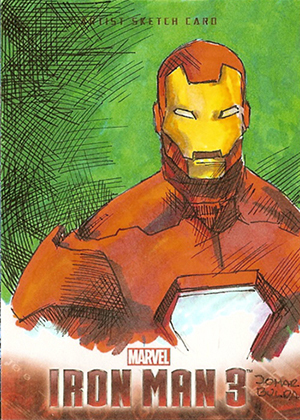 Redemption cards for OG Iron Man comics would be pretty awesome…or a life-sized Iron Man.